Two Maybelline lovers got the surprise of their lives when Liza Soberano sold them Maybelline Clear Smooth All In One!!! See the video now!!! Who knows, it can happen to anyone of us one of these days? These two girls went to SM North Edsa wanting to buy Maybelline Clear Smooth All In One powder again as one had already run out of hers. When Liza was making her sales pitch, they sort of knew that it was her but couldn't really fathom that it could actually be humanly possible for Liza to sell powder to them. Tis was proof that one's wildest dreams can come true! These fans were so surprised over what happened and feel so lucky and blessed to have met Liza Soberano. Liza looks good in her Maybelline Beauty Adviser outfit! This getup, partnered with large sunglasses and a Maybelline cap, really made her an efficient part of the sales force. She was able to deliver her sales pitch perfectly and was able to make a sale (she directly sold two powders to the ladies). Although Liza's appearance alone was enough to bring crazy sales values for sure. Liza went for a change and got into her usual Maybelline girl outfit. Edgy, modern, and naturally beautiful. 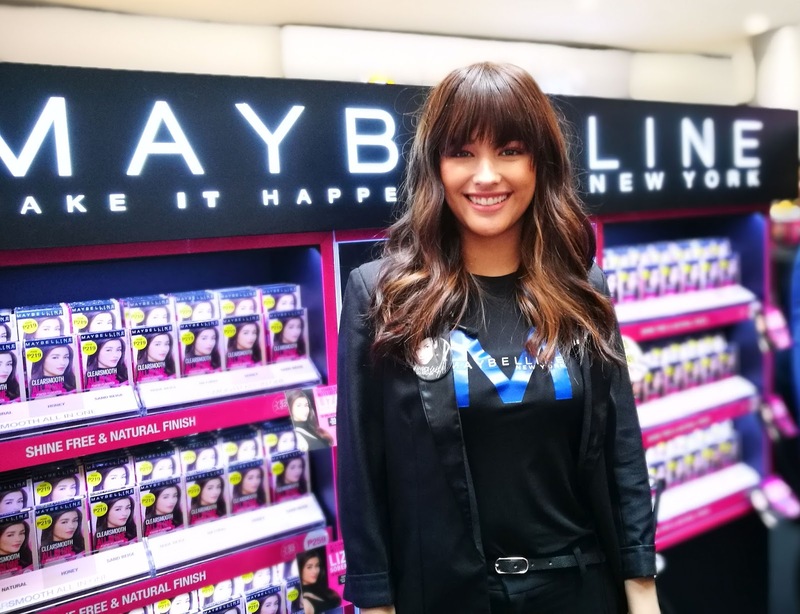 She had great fun pulling off the gimmick in cooperation with the Maybelline Philippines management team. Who knows? She might grace a store near you soon! Napakaswerte naman tlga nung 2 girls! kung ako sa kanila itotodo ko na! nahawaka ko na si Liza plus hug 10000x!! I love Liza! Galing ng Maybelline! Event that I missed. HUHUHUHU kasi may duty that daaaay. Lucky girls , indeed! Liza S. perfect for this make up brand!